Good morning everyone, I trust most of you're ready for the rest of summer that lies before us. Me, with the sigh of a sad trombone playing in the back, have a terrible case of tendonitis in my foot, making life a bit unbearable, as weight bearing is quite painful, ugh, wait no, double ugh. So what to do, whine or wine? Hmm, I think I'll uncork a bottle of suave sophistication and see where the evening goes from there. Okay, so where have all the balanced, nuanced wines gone? Good question, one place not to look, exceptions noted, are the mega-purple infused puddles of purple goo lining the bottom shelf of most grocery stores. I picked up this gem in a tasting room, on one of my previous trips to Oregon wine country, before moving here. That said, the wine above will make your heart sing, and help you forget about your troubles if there be any, and if all is smooth sailing, put the exclamation point on that zen moment you're having after work. Funny, I went all the way to Oregon to discover this little gem from Burgundy, but as I've come to find out, there are many beautiful things to be found in unexpected places when you keep your eyes open, and you allow your curiosity take over. If you've been thinking about putting a toe in the pool of true Burgundian wines, then may I suggest this bottle [pictured above] it would be an excellent place to get started. The price of admission is $40 to $50 depending on where you shop, but well worth it. I scored the wine 90 points and highly recommend you giving it a swirl. At Joseph Drouhin, you will find unique balance, one where tradition and modern techniques blend together and come together to create wines which genuinely characterizes modern winemaking. Whether it's their vineyard management via their on-site nursery, the 100% hand harvesting, open fermenters, and the judicious use of 100% French Oak, one thing you easily take away from their wines is that sense of place, something so often missing in domestically produced juice. For those of you looking to get your hands on wines which are Organically Certified, you'll be happy to know that starting with their 2009 vintage and moving forward you can have confidence they're following an 'organic' certification process. They (JD) have also recently been awarded "organic certification" [an expensive and laborious process] for all grapes grown within its vineyards. As it would happen, the wine is this review spotlight is a 2009 and a fantastic representation of exciting, different styles of quality in regards to Pinot Noir than you may be used to. But stick with me, and you will see this wine makes a great starting point for dipping your toe in the proverbial Burgundian pool [well at least I think so]. Another point to take note of, 2009 in Burgundy is what I'd call an 'outlier' type year, as there was a bit of heat spike in the months leading up to harvest, in general, much of the vintage is a bit 'riper' then it would typically be. There's nothing fancy here, just honest-to-goodness Pinot Pleasure. Is this wine going to set your hair on fire? Uh, most likely not, but what it will do is allure you with its suave sophistication and beckon you to more fully explore this region [if you have not done so already]. In my ever not so humble opinion, this would be the perfect wine to open and enjoy with [yes, I do love a redundant prepostion] with any summer get together; whether it be traditional duck confit, seared Ahi or even a rack of lamb [oh-my], this wine is extremely versatile, food-friendly and could be easily become your best friend as well. 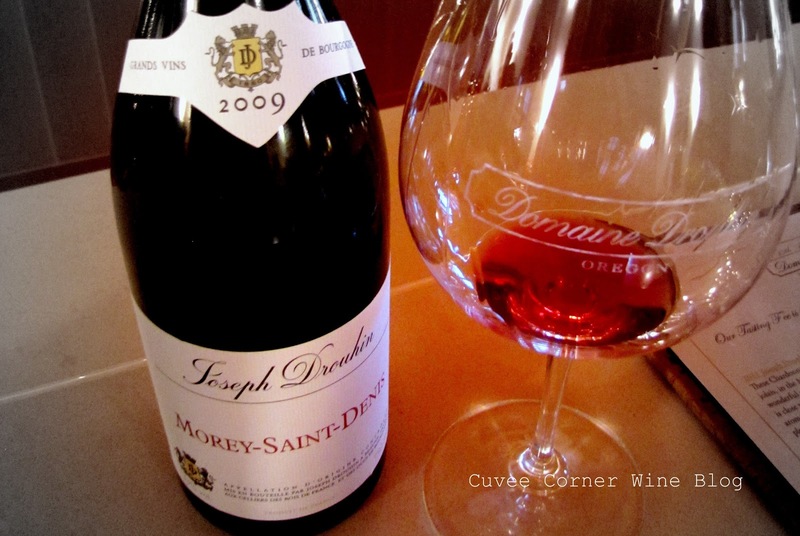 By the way; this just may be a bit of bragging on their part, but does appear to be quite accurate, that the village of Morey is located between Gevrey-Chambertin and Chambolle-Musigny. Here comes the bragging part, "there are five Grand Crus and twelve Premier Crus in this relatively small appellation". I'd recommend a bit of decanting before diving in, but what you'll find on the nose is dried cherries, raspberries, and sweet leather. The palate shows excellent structure and weight, but like many of the 2009's it is very approachable, with easily plucked low-hanging fruit, balance nicely with rich earth. The finish is long, lasting. This wine is in my estimation the "complete package" one that will have you wanting more, so be one of the smart vino-sapiens and order more than just one bottle. Until next time folks remember to sip long and prosper cheers!